Wastewater treatment is a worldwide problem. Most of these are not collected or subject to any treatment. Numerous investigations show that approximately 80 percent of the world's wastewater is discharged into the environment without proper treatment. However, in recent years there is an entire environmental movement -sustained in technological advances- that attempts to reverse the perception of this phenomenon. They are talking of changing these waters "from waste to resource" and it is becoming common practice-compulsory if you will-the installation of Wastewater Treatment Plants (WWTP), which contribute to the so-called "circular economy". In spite of its efforts in protecting the environment, Cuba has not been left out of this problem and has had to overcome numerous obstacles to the acquisition of technologies and resources necessary for its development. For example, in the country only two plants work for this kind of processing. They are in the capital. However, several relevant companies in Cuba are in an investment process that includes the modernization of their waste treatment plants, including Cuba Ron specifically, the Santa Cruz rum factory. In addition, since 2017 the country has implemented the Life Task –a strategy created by the State in the face of climate change-, which searches, among many other things, "to prioritize scientific-technological research at throughout the Macro project on coastal hazards and vulnerability for the years 2050-2100 ". The chemicals generated by the distillation process of the rum industries have been identified as one of the risk factors for the environment at an international level. In this sense, protocols of good practices and technologies have been designed to control the impact of chemical processes resulting from industrial production. The United Nations Report about the Development of Water Resources in the World prepared by the World Water Assessment Program of UNESCO in 2017, details the use of wastewater as one of the common solutions in various countries to generate energy. In low-income countries, only 8% of domestic and industrial wastewater is treated, while in high-income nations it reaches 70%. In general, the document focuses in possible solutions in the processing of the reuse of water and generate other raw materials, for example, "in the industry can be reused large quantities of water for heating and cooling, instead of pouring them into the ambience". According to the report, "the majority of governments and decision-makers have been essentially concerned with the problems of water supply, especially when this is in short supply (...) The collection, treatment and safe use of wastewater are the basis of a circular economy, in which economic development and the sustainable use of resources are balanced ". There are several efforts to achieve efficient and sustainable waste treatment in Cuba. In the livestock centers of the Hydraulic Utilization Company of Villa Clara, for example, wastewater treatment systems were applied and managed to "prevent pollution, minimize biological risks, improve the final disposal of effluents to the soil to increase the production of cultivated plants." Recently, a novel plant for the treatment of industrial waste was installed in the brewery of the Old Tobacco and Wood Warehouse in Old Havana. This plant was the result of collaboration between the Technological University of Havana José Antonio Echeverría (CUJAE), the National Institute of Hydraulic Resources (INRH) and the Institute for Water Education (UNESCO-IHE) based in Delft, Netherlands. It is also contemplated within the program to face the drought, allowing the return of the water used in the brewing to the Bay of Havana without traces of contamination. According to Karl-Ulrich Rudolph founder of the German Consultant company of Environmental Engineering and Management -and speaker in Havana in 2015-, "Cuba has ample possibilities and conditions for the reuse of wastewater, because there is political will and it presents appropriate scenarios for that purpose." The German expert highlighted in that meeting the potential of the Island to install more efficient and advanced technologies in the treatment of liquid waste, and pointed out the challenges posed by the modernization of the infrastructure for the reuse of water. The rum industry is one of the most important in Cuba. Economically, Cuba Ron Corporation represents one of the most internationally recognized companies of this type. Followed by seafood, the commercialization of rum brands is the main export item of the Cuban food industry. By 2020, the development strategy projects the commercialization of some 4.3 million boxes with an expected income of 157 million dollars. From the cultural point of view, the good rum is distinctive of the Island. Brands such as Havana Club Santiago de Cuba or Cubay have been linked to the history of the country and the formation of national identity with a strength similar to tobacco, music and sugar. The Cuba Ron Corporation maintains the standards of a highly quoted production worldwide (the only company in the country that holds the right to use the Protected Designation of Origin -DOP- CUBA for rums under the guidelines of sustainable development that implies the constant search for solutions for the care of the environment. This, with the circumstance of the United States blockade against Cuba that has limited its potential. According to the Prensa Latina news agency, the food and agricultural industries are today two of the most affected in Cuba because of the blockade. Details that, particularly the losses for the productions of the company Ron Havana Club, belonging to the Corporation Cuba Ron S.A., amount to 90 million 930 thousand dollars, given the impossibility of accessing the US market. Legislation 211 prevents US courts from recognizing trademarks and Cuban patents. 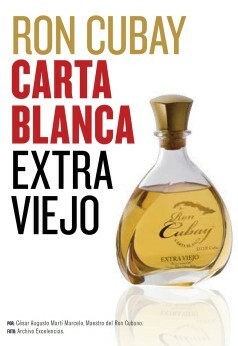 In the case of other brands such as Santiago de Cuba, Isla del Tesoro, Perla del Norte and Cubay, the calculations place the export potential to the US market at no less than 200,000 boxes per year. However, the impact on the development of Cuba Ron is not only noticeable in the field of economic exchanges and commercialization, but also in investments to improve production and acquire appropriate technologies to reduce and avoid environmental pollution. Good practices for caring the environment were reinforced with the Life Task. However, Cuba Ron was already making efforts to balance production and environmental sustainability. Since 2013, it has implemented the Integrated Management System (SGI) at Santa Cruz, one of its most important distilleries. Located north of the Mayabeque province, it produces the white and gold rums of the Havana Club brand, Cuba's leading product, which, like the rest of the company's productions, boast the Protected Designation of Origin (PDO) Cuba for rums. According to the study "Main environmental problems affecting the municipality of Santa Cruz del Norte", presented at the IX Cuban Congress of Geology in 2011, the main environmental disadvantage generated by the rum factory was associated with "the appearance of gaseous emissions and fuel spills". With the support of the English company Lloyd's Register, dedicated to the classification and organization of risk analysis, fundamental lines were defined for maintenance, renewal of certification and re-audit, as well as the solution of the environmental effects. 1. Rehabilitation of the internal network of residuals. Made from December 2016 to August 2017, the investment amounted to 137,338 in total currency. 2. Construction of an underwater outlet up to a distance of 611 meters. The environmental license granted certifies that this action complies with the rules of dumping in coastal areas, while not exceeding the flow of 2000 cubic meters per day of waste soft drinks, yeast and distillery. The value of the investment amounts to 1 million 216 thousand 863 in total currency. 3. Installation and start-up of a waste treatment plant, for the use of waste as a source of renewable energy, a solution that the Corporation defines as the "definitive solution to the issue of environmental pollution". Currently, Santa Cruz is in an investment process that also includes the recovery of all its ships, the modernization of its distillery and other areas in general, based on a commitment to the sustainability and quality of its production.